After reading feedback you’ve received from other eBay members, you may feel compelled to respond. If the feedback is negative, you may want to defend yourself. If it’s positive, you may want to thank the person who left it. 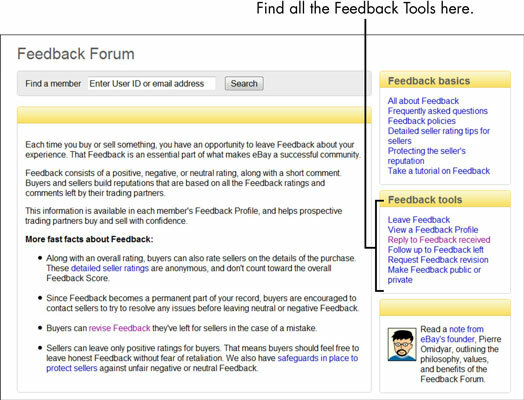 To respond to feedback, click the Feedback link in the drop-down menu under the Account tab on your My eBay page and then click the Go to Feedback Forum link at the top of the page. You’re transported to the Feedback Forum, where you can reply to feedback comments left for you. Click the Reply to Feedback Received link on the right side of the page in the Feedback Tools box. On the Reply to Feedback page, find the feedback you want to respond to and click the Reply link. Type your response and click Leave Reply. If you want to follow up to a feedback you’ve already left for someone, follow the preceding steps, but click the Follow Up to Feedback Left link on the Feedback Forum page. Do not confuse replying to feedback with leaving feedback. Replying does not change the other user’s feedback rating; it merely adds a line below the feedback with your response. Replying is optional and courteous; leaving rated feedback is vital.